Wondering what's the hopper? Wonder no more, here you go! 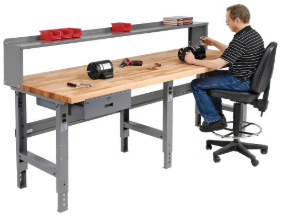 Stock photo of workbench for now, with plans to share actual photos of my work bench. My dedicated space now includes a 4 foot by 8 foot Global Industrial Maple Butcher Block Workbench that I sanded and stained, adding Teflon feet that allow me to slide things around with ease, with shelfing to keep all my important stuff close by, and handy space for 8' of backdrop paper that I can change easily at any time. I plan to provide an on camera tour this year, in 4K, of course. Finally my home is properly equipped to unbox, test, podcast, and blog, without "temporarily" leaving my stuff all over the family's ping pong table. Temporary became 5 years. You can see a preview of my studio here and here. Testing of a 10G Synology NAS is happening soon, now I have the room to run those tests in parallel with ongoing Xeon D work. 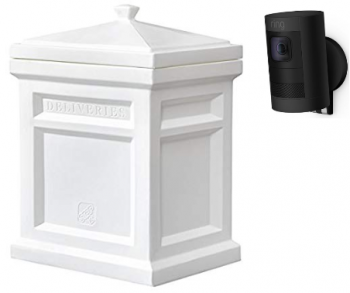 I have also cooked up some particularly effective and somewhat suprising technology pairings, including some recent gadgets I've been testing seen here that include this front-step delivery box coupled with the Ring Stick Up Cam aimed right at it. First hands-on look at the 8 core Xeon D-2100 based Supermicro SuperServer SYS-E300-9D-8CN8TP. Yes, I'll be changing things up a bit this year, experimenting with potential ways to make the Xeon D-2100's capabilities shine while running quietly. That will require some surgery, should be fun! Of course, my work with the beloved and best selling Xeon D-1500 will continue for years, given the incredible reliability and versatility the mini-tower Bundles continue to deliver to many hundreds of virtualization enthusiasts out there, thanks to Wiredzone. 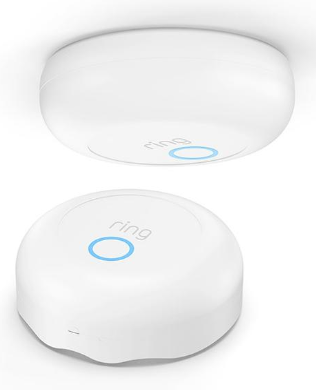 New articles about the new Ring Alarm Smoke & CO Listener that I successfully unboxed and configured today. I'll also be looking at the Ring Alarm Flood & Freeze Sensor soon too. Unfortunately, some worrisome press coverage about Ring security lately to discuss too, something I won't be glossing over. 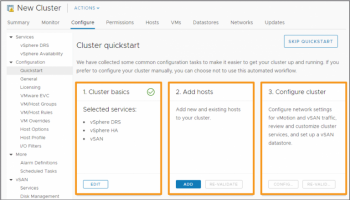 Work on finding more affordable ways to try vSAN in a home lab continue, behind the scenes, and on TinkerTry. There have been many promising new releases of NAND and Optane based SSDs lately, including the great-for-home-labs M.2 form factor. It's been a huge plus to be pure HTML5 lately, with no more Adobe Flash or Java needed for any of my sysadmin, including vSphere Client's amazing new Quickstart workflows that include vSAN, and Supermicro's iKVM (IPMI). Indeed, Adobe Flash can’t die soon enough. There is so much to do here, with Update 1 being such an important update. It's a very polished release that I'm thoroughly enjoying using on a daily basis, and is easier to install than ever before on Intel Xeon D systems, and not just on Supermicro. Testing Windows Server 2019 and Windows 10 October 2018 Update 1809 with backup agents including the upcoming Veeam Agent for Windows 3.0, and native VM backup products. Yes, my old favorite topic starting back in 2011, including new form factors by big names: undercounter, kitchen, microwave, dining room, including a close look at the GE Lighting relax™ HD 100 watt equivalent LED bulb. All with high quility, and high CRI, with dimmers that actually work. A tast of Hello Fresh and a lower carb alternative Home Chef. Both are delicious and have changed things in my home considerably, for the better. We also enjoy having far less uneaten food going to waste. I'll be adding to my Tesla articles, and yes, I'm excited about this EV (Electric Vehicle), the most anticipated car ever built. Tesla is striving to hit that $35,000 price that the average gasoline car costs these days. It's always connected and updated, the epitome of IoT (Internet of Things), just a very big and fast Thing, with an impressive reward for a hacker who can break it. There will also be my first hands-on look at what getting an EV Charger upgrade to my home involved with some fun timelapse of the electrical work, and a first hands-on look at the new (released yesterday) Wall Connector with 14-50 Plug. Finally, many more updates to my Model 3 accessories article to come, all based on first-hand testing. Finally, I'll have some experiences with Sense Energy Monitor to share, especially now that they've announced Tesla Model 3 detection.